May 4, 2015 Geren W. Mortensen, Jr. 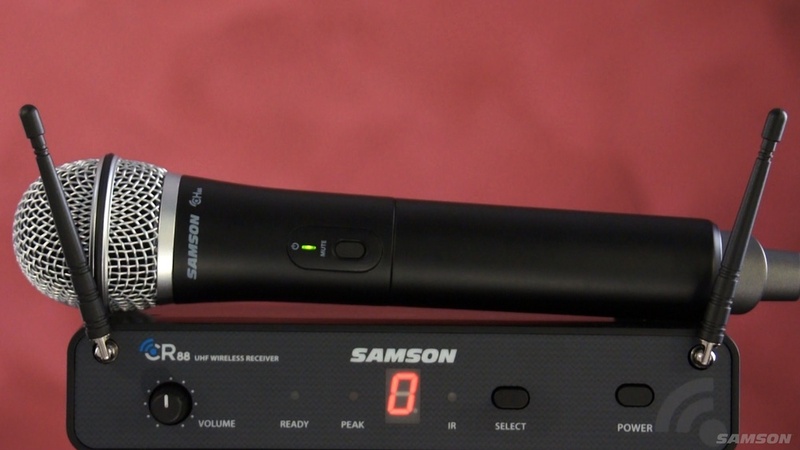 I recently ordered and received a Samson Concert 88 handheld wireless mic system, based on my experiences with Samson wireless mics many years ago -- and after consultation with Carson, my Sweetwater sales rep. I contacted Carson first, because I wanted to confirm that Samson still represented the kind of value that they did in the past. Of course, I'm relying on the opinion of a sales rep, but my experience has been that Carson has always answered my questions with my best interest in mind, which is part of why I've been dealing with him for over eight years now. I must say that, for the money, I am really very impressed. While this is certainly not at the level of a $1000, nor even a $600, wireless system, it certainly represents a fantastic value. It sounds good and so far, it works well. Samson Concert 88 systems are available in hand-held, guitar, lavaliere, and headset versions. What follows are the observations of a somewhat jaded live sound engineer and musician who's been at this for over 3 decades. My review is based on my initial unboxing, and using the system while practicing with my band, which tends to play a little too loud in a space that's too small and is acoustically horrible. We'll be taking the mic out live this weekend, so at some point, I'll have some follow-up thoughts. Before the review, I should probably explain why, after all my warnings about UHF wireless systems (see my comments here and here), I decided to buy one. The FCC has unveiled their current plan covering UHF wireless spectrum, and it seems that the 500MHz band will remain untouched for at least another few years. 600MHz goes on the auction block very soon, if it's not already, and we'll soon be in the 39-month transition period. So, as long as I chose carefully, I could be assured of getting at least 5-6 years or more of service out of my investment, by which time 2.4GHz systems should be mature and well priced. At the price of these systems, even if I bought 4 of them, I'd come in under the price of a single mid-grade wireless system, and get the same usable life, at the cost of a little flexibility. I'm good with that. So, on with my "review." Setup is super simple: power on the receiver and, using the SET button, select a channel. Then, power up the mic with the battery cover off, point the IR dot in the mic at the IR dot on the receiver and hold the SET button on the receiver until the LED starts flashing. Let go of the SET button, and wait for the ready light to come on. Then, put the battery cover on the mic, hook up the cable, and sing. Speaking of singing, the sound quality of the Samson Q6 microphone is quite nice -- I think better than an SM58, if only because it doesn't have that huge proximity effect that the SM58 does. Our singer's vocals were crystal clear, no matter what he did, and harmonica really cut through brilliantly. Feedback rejection was very impressive as well -- even with the volume at uncomfortable levels (I wear my Westone ES49s at all practices! ), we didn't experience any feedback. We didn't notice any weird RF issues, like dropouts or strange noises or pops, but again, we were in our practice space, and the receiver was no more than about 15' from the singer. With that said, I usually prefer to have my wireless gear on stage, as opposed to out in the house, so I'll usually have this fairly close to the performer. The outputs around the back are both balanced XLR and unbalanced (TS) 1/4". I doubt I'll ever use the unbalanced output, but it's there. The XLR output has good level, and the signal is nice and clean. This next one may seem minor, but for me, it's a thing: The antennae are on the face of the receiver instead of the back, which makes it easy to mount in a rack without worrying about where the antennae are positioned. So, what are the downsides? What didn't I like? The level control and buttons feel a little chintzy. The antennae are non-removable, so if the swivel or an antenna breaks, it means the receiver has to be sent in for repair. Since the antennae are non-removable, you can't use a single pair of antennae for multiple receivers. The included rack mount is also plastic, and feels fairly brittle, so care will required when mounting the receiver to avoid cracking the mount. The mic is a little more susceptible to handling noise than some other, more expensive wireless mics. It's easy to accidentally hit the mute switch on the mic. Samson doesn't include a mic stand clip. There are only 16 channels per frequency band, and there are currently only two bands available for the US/Canadian market. One of those bands is in the 600MHz band. The power supply is a wall wart, and it's slightly too fat to allow side-by-side placement on most power strips. Am I happy with my purchase, and would I recommend this to a friend? In a word, yes to both, but with caveats. I wouldn't use the Concert 88 system on a national tour because of the construction and limited number of frequencies. But for local bands, DJs and karaoke, houses of worship and schools, or anyone on a tight budget, the Concert 88 series is a great deal. Just don't throw the receiver around like you would a typical guitar stomp box, and I'm sure everything will hold up just fine. At this point, yes. In fact, I plan to buy at least one more, and possibly as many as three, as my nearly non-existent budget permits. December 6, 2011 Geren W. Mortensen, Jr.
After our most recent gig, it became abundantly apparent that we need monitors of some sort, be they floor wedges or wireless or some combination thereof. Our bass player currently owns a UHF in-ear system that he's almost never used. I'd like to go wireless, too, as would our other backup vocalist. But, as a seven-piece band with as many as five singers, this could be an expensive proposition. And, I'm concerned about the future of the rest of the UHF band. When the government-mandated transition from analog to digital television occurred here in the US, a couple of other things happened, at least one of which directly affected musicians using wireless microphones, instruments and in-ear monitoring systems. Specifically a large chunk of the UHF radio band, which was previously used for our wireless gear was declared off-limits. I don't have to tell you that decent wireless gear is expensive. The best price I've found so far on a decent-quality UHF personal monitor is around $350 for the Carvin EM900 system. UHF spectrum is like gold to the wireless communications industry (cell phones, two-way radios, etc.) who benefited most from the UHF frequencies made vacant by the DTV transition, and it's only a matter of time before they lobby the government and win the rest of "our" airspace. So, I began looking at what's going on in other wireless market segments. The answer is that there is a large allocation in the 2.4GHz range for digital spread-spectrum systems. The technology is mature, and you're already familiar with some of -- cordless phones, wireless networking and even baby monitors are operating using this technology now, along with radio controlled model airplanes, cars and boats. Because so many consumer industries are using this technology, that also means that the it's relatively cheap! Digital spread spectrum is a great technology for our use as musicians because, once a transmitter and receiver are "paired" (just like a Bluetooth earpiece gets paired to your cell phone), they always "know" each other. When they first get turned on in a new location, they negotiate with other 2.4GHz devices so that many, many systems can operate together without any interference whatsoever. And, a single transmitter can be "paired" to several different receivers, just as easily as pairing that Bluetooth gizmo to your phone. Knowing all this, you'd think that there would be a ton of inexpensive 2.4GHz wireless systems for musicians out there. There are already amazing 2.4GHz radio control systems out there for under $100! But, as near as I can tell, there are only two companies using this technology. Line6 has products for wireless guitar/bass and vocals, but no in-ear monitors. The other company I've found is Jangus Music. Yeah, I've never heard of them either. Based on a common transmitter/receiver pair, Jangus systems start at around $190. If you're a guitarist, it comes with everything you need. For in-ear monitors, you'll need to add a pair of ear-buds. If you're looking for a head-worn mic, they have a "kit" or sell their very nice headset mic system separately (along with adapters to use their mic system with any wireless or wired PA). If you're a keyboardist, each system can support a single stereo keyboard, or two keyboards, if you run mono like I do! Guitarists might like their integrated strap/transmitter setup. There are no pictures of it on their web site, but they do mention it in all of their literature. The Jangus system also looks to be a great solution for videographers or digital film-makers using an HDSLR rig.